I will admit that when Paper Pumpkin was first released, the kits were ok. Not incredible, but definitely ok. Well, the kits have come a long way in the five years we’ve had them and I think this year has been the best collection of kits yet. Every month is better than the prior one. And the amount of supplies and projects you get is incredible for the cost, which is $19.95 per month including the shipping. November’s Paper Pumpkin kit is another one month that turned out fabulous. It is a set of ten Holiday cards with that gorgeous plaid. The envelopes coordinate with cards as well. 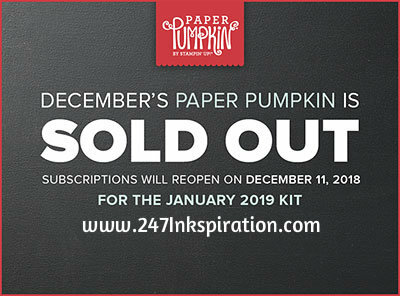 Ok, here’s the bad news… The December Paper Pumpkin kit is sold out. Yes, that’s correct. 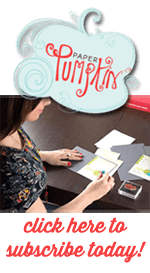 If you are not already signed up to get the Paper Pumpkin kit, then you are out of luck for this month. The good news is that you can sign up starting tomorrow to get the January kit. Tomorrow, click the Paper Pumpkin link on the left and it will take you to my shop to sign up to start receiving your own Paper Pumpkin kits in the mail. Oh my goodness! Guess what’s now available. It’s a tote bag for your Stamparatus. And it is beautiful. There is plenty of pockets inside to hold your Stamparatus, some extra plates, and your grid paper. You are going to love this tote bag. This bag will be available now and it’s $29 (item #149695). If you’ve been waiting to purchase the Stamparatus until the tote was available, you can buy both as a bundle for $78 (item #151961).